Mario Kart 8 Deluxe on the Nintendo Switch. The postponement was made "in order to improve quality of the application and expand the content offerings after launch," the Japanese company said in its quarterly earnings. Such delays are relatively common in the game industry, since developers can discover major bugs at the last minute, or realize that certain gameplay mechanics need to be improved. Nintendo has said virtually nothing about "Tour" since announcing it exactly one year ago. Its partner on the game, DeNA, at one point said the title will be "free-to-start," without elaborating on what players might have to pay for. 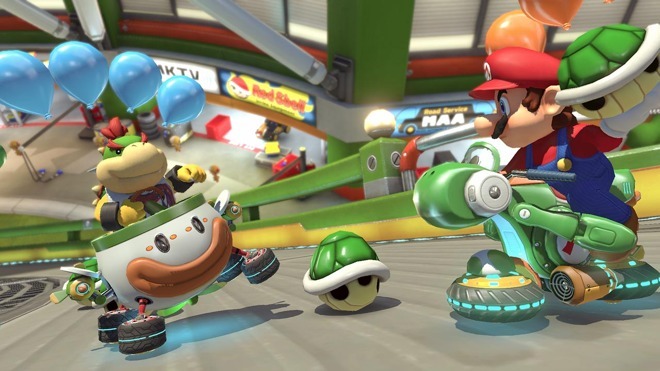 "Mario Kart" is one of Nintendo's most successful and long-running franchises, dating back to 1992. Gamers race as various characters in the "Super Mario Bros." universe, using power-ups on the track to gain speed or sabotage opponents. The company has been cautious about stepping into the world of phone and tablet gaming. While eager to tap its popularity, especially in Japan, investing too deeply could risk lucrative console sales. There are only four Nintendo games currently on the App Store, namely Super Mario Run, Fire Emblem Heroes, Animal Crossing: Pocket Camp, and Dragalia Lost. I look forward to this game when it comes out. There's nothing more I hate than FREEMIUM apps/Games. Give me a price for the full game and I'll pay that. With all these Nintendo games coming to iPhone/iPad, Apple should really strengthen their partnership with Nintendo. Versions for the next Apple TV iteration please! Seems every Nintendo game is "jumping off track". Metroid 4 was just "restarted" for Switch, after years of development. Wonder if I'll see it in my lifetime. I hate forced sequels. It's "Metroid Prime 4" which was originally written as a trilogy. Just make a new damn Metroid. Amen! Let me pay once and leave me alone! I would also love this to come to AppleTV but I highly doubt they will do so. If Nintendo is worried about console sales then releasing their games for AppleTV would be the last thing they would do. Unless they go the way of Sega and stop making consoles I don't hold much hope of them ever releasing games for the AppleTV. Even Sega has only released a few of their games for AppleTV. Super Mario 64 and Mario Kart were my two all-time favorite games. Can’t wait for Mario Kart Tour to come out.